"Lookie Mommy!" and shows you this as his newly found treasure? Freak out, then thank the sweet Lord above that this particular hornet is already dead. Then laugh a little, or a lot, at the things that boys do. I about had a heart attack when I saw that picture!!! 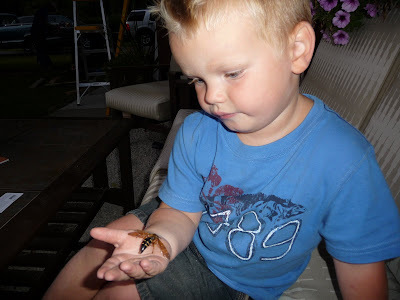 Glad Cameron's "new friend" was not able to harm him in any way!!! Oh my goodness. That is too funny and very scary. I got stung about a month ago and it hurt worse then I remembered. Since then I am not found of bees, wasps and the like, especially when they are near my babies. 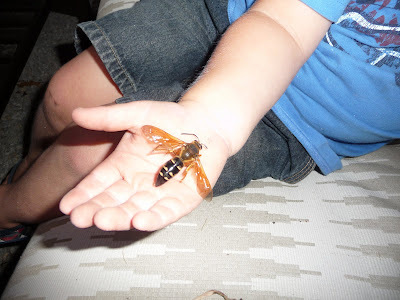 So glad your sweet boy collected a dead hornet and did not get stung. PS My signature name changed as I eventually want to get our last name off of our blog. Oh my...I had a small heart attack when I opened your page! Scary, but glad it was dead...boys will be boys!